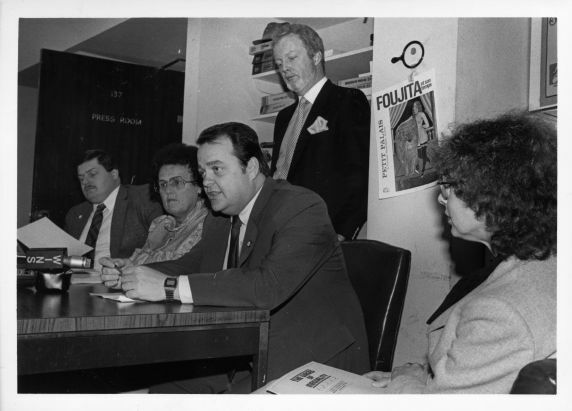 Pay equity press conference, Nassau County, New York, 1983. Representatives from the Civil Service Employees Association, AFSCME, presented the findings of a pay equity study done by AFSCME’s Public Policy Department in the county, which found patterns of wage discrimination. Seated, from left to right: Jerry Donahue, Nassau County CSEA president; Rita Wallace, CSEA first vice president, Nassau County; Danny Donohue, Region I CSEA president; Marilyn DePoy, AFSCME specialist; standing: Hugh O’Haire, CSEA communication specialist. Part of this image appeared in the June 1983 issue of AFSCME’s Public Employee magazine.